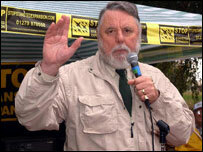 Former hostage Terry Waite is returning to Lebanon for the first time since being released in 1992 after five years in captivity. The former special envoy for the Archbishop of Canterbury, who lives in Hartest, near Bury St Edmunds, is travelling to Beirut for the YMCA. During his visit he will meet young people who benefit from the Y-Care International programme. He will collect material for the organisation's 20th anniversary events. Mr Waite's ordeal began in 1987 when he was seized as he attempted to negotiate the release of hostages on behalf of the Archbishop of Canterbury. He spent most of his years in captivity in darkness chained to a wall in solitary confinement. On Monday Mr Waite told the BBC he was not sure how he would feel returning to Lebanon. "I won't know my reaction until that plane has touched down, until I am back on Lebanese soil," he said. "It will be interesting - Lebanon has changed dramatically since I was there. I have memories of a city in ruins, I gather it has been rebuilt." Asked how he would feel about meeting the people who held him hostage, Mr Waite replied that he thought it was "highly unlikely". "I understand the Americans put a reward on their heads of $1m, and I don't think they will come out and see me while it's there. "But I wouldn't mind meeting them. It would be very interesting to see where they are some years later."